A couple months back, Costco’s coupon book included a coupon for Chocolate Cheerios and while I am constantly falling into the trap of buying crappy boxes of cereal in disgustingly large amounts from my favorite wholesale warehouse, this sounded good enough to try. Plus, it’s chocolate, how bad could it be? It took me a while to bust it out. For some reason, I felt like it was going to go the way of my box of Multi-Grain Cheerios, which is gathering dust as we speak, so I just put it away and forgot about it. Then one morning as my son made this heartbreaking crushed face at me when I informed him that Daddy had inhaled the last of the Cocoa Krispies the night before, I dashed to the cupboard and Chocolate Cheerios came to the rescue. At least, I hoped it would. I had no idea how they would taste. I poured a bowl for myself to see. The end result is that a week later, we’re halfway into the second bag. 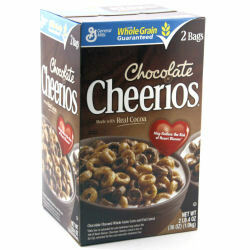 They’re light and crispy with a delicious chocolate taste and they don’t become soggy at the blink of an eye, though like most cereals, you can’t leave it sitting around in milk as you la-dee-dah around the house getting ready. The rings come in two tones, so I’m guessing the light ones have less chocolate, which helps them to reduce sugar and calorie content. Of course, I shouldn’t forget to mention that it leaves you with a wonderful bowl of chocolate milk to gulp down at the end of the bowl. Nutritionally, they’re very low in calories at just 100 per 3/4 cup serving (without milk). Sugar content is moderate at 9 grams per serving (the same as Honey Nut Cheerios), which is 3 grams less than Cocoa Krispies, 5 grams less than a bowl of Smart Start and 10 grams less than Raisin Bran. For a hit of chocolate in the morning, that’s something I can get behind. 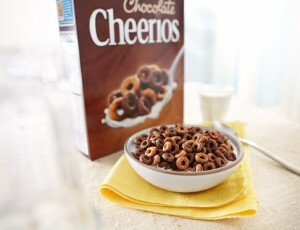 Second image courtesy of the Cheerios website.